The International Astronomical Union (IAU) will announce the results of its "Name the Exoworlds" campaign. The first official, publicly chosen exoplanet names will be unveiled today. The International Astronomical Union (IAU) will announce the results of its "Name the Exoworlds" campaign — which asked the public to vote on common monikers for 32 alien planets in 20 different star systems — during a press conference this evening (Aug. 11) at the group's 29th General Assembly in Honolulu, Hawaii. So, for example, the five planets discovered orbiting the star Kepler-186 are known as Kepler-186b, Kepler-186c, Kepler-186d, Kepler-186e and Kepler-186f. The names of the host stars, for their part, are often pulled from catalogues or are taken from the instrument or mission that discovered them (NASA's planet-hunting Kepler Space Telescope in the case of Kepler-186). Such scientific monikers can be technical and tough to remember, especially for laypeople. There are planets out there, for instance, called HD 104985b and OGLE-2005-BLG-169Lb. The "Name the Exoworlds" project is an attempt to bring the public into the process a bit, IAU representatives have said. From April through June, astronomy clubs and nonprofit groups submitted common names for the 32 exoplanets and 15 of the 20 host stars (the other five stars already had common names). The public was then invited to vote on the proposed appellations. The IAU assigns "official" names to celestial objects and their features. The organization is perhaps best known to nonscientists for its 2006 reclassification of Pluto from "true planet" to "dwarf planet," a decision that remains controversial today. The IAU has its hands full just keeping up with discoveries made in Earth's solar system. For example, the organization must sift through the many names proposed by team members of NASA's New Horizons and Dawn missions, which are drawing up the first detailed maps of the dwarf planet Pluto and Ceres, respectively. "Name the Exoworlds" isn't the first project that sought the public's help in giving exoplanets common names. While the Alpha Centauri Bb contest was going on, the IAU issued a press release asserting its authority as the sole arbiter of the exoplanet-naming process and reminding readers that it's not possible to buy an "official" name. Though Uwingu was not mentioned by name, the release seemed aimed at the company's activities. In an interesting twist, the CEO of Uwingu is Alan Stern, who is also the principal investigator of the New Horizons mission — and a longtime and outspoken critic of the IAU's 2006 reclassification of Pluto. Scientists have discovered nearly 2,000 alien planets to date, but that number is just the tip of the iceberg. 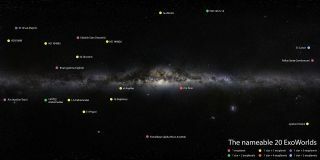 The Kepler spacecraft's observations suggest that each of the Milky Way galaxy's stars hosts at least one planet on average, and many of these worlds may be capable of supporting life.